My Husband and I got away last weekend. Well, not the whole weekend (that would be outrageous!) but we escaped across the Golden Gate Bridge and spent one glorious night at Cavallo Point. We were once better at weekend escapes. When the girls were younger we would swap kids with our friends who had daughters the same age. It was a win-win as they say. Sleep over fun for the girls! Sleep over fun for the parents! And no matter how hard your weekend with the kids might prove to be (and it was never that hard – turns out having more kids around made things easier) we could handle it knowing our turn was coming. It was the best thing EVER. The other mom and I would routinely pat ourselves on the back at the sheer genius of our trade plan. Our other friends were rightly jealous; our kids looked forward to the swap. And then the kids turn 15, 16, 17, 18, and don’t feel like they need to have someone “watch” them when we go away. They want to stay home alone (don’t you trust me?). And you want to (trust them), but somehow the weekends away become less frequent. Because, well, you do trust them (sort of), but you worry. Because there was that time you were away and you got the crying phone call from Daughter 2.0 and before you have the chance to understand what she is saying Daughter 1.0 pings in on the call waiting yelling at you about how her sister is overreacting – I only asked her to put lotion on my back, and why is she so weirded out by naked bodies, and so I had to kick her in the stomach – and you find out later that week that when Daughter 2.0 texted you (and the mom down the hill who you asked to keep an eye on the girls) that she was home safe and sound in bed, going to sleep, that really she was out at a party with a bunch of kids you (and she) don’t even know. You run a cost benefit analysis and decide going away might not be worth it. It’s something like when your kids are little and you have a standing babysitter for date night. We had this and I would say it is the single most important piece of parenting advice I could give. Get a babysitter! Get out of the house, at least one evening a week, with your partner! Even if your date consists of sitting in the car drinking coffee until you know it’s safe to go home, i.e. the kids are asleep, don’t skip date night. It may be the only way to finish a conversation with your spouse. When Daughter 1.0 turned 12, old enough to “babysit” her little sister, we stopped hiring a sitter for date night, and we stopped having date night. You would think not having to pay for a sitter would make us go out more, but we went out less. I think I’m lucky because I like my Husband. He is the person I want to spend my free time with. Even when, on our night away last weekend, he whispered in my ear at 7:00 in the morning, asking if I’m ready for coffee. 7:00 in the morning! When we are away from the kids and the animals and could sleep late, like, I don’t know, until 8:00? But he didn’t want me to miss the 8:00 yoga class. I hate yoga! But that’s another story. We’ve done a fairly good job over the years of protecting our relationship, safeguarding it against those nasty (wonderful) creatures we decided to create (our Daughters). Those Daughters are fast becoming independent adults who will move out (God willing) and have nasty (wonderful) creatures of their own one day (not too soon) and the person I will be left with is my Husband. I was thinking recently about how I remember our lives before children (fondly). To me it feels like a long expanse of time when we did so much and experienced so many things. In reality it was only about six years. We have been parents for over 18. But I think that my perception of what a long and rich time that was bodes well for how my Husband and I will transition into empty nesters. Aside – I don’t like that term empty nest, because, really, our nest won’t be empty. We’ll still be here, feathering it. Even if we are relegated to the category of “just parents”, something I once overheard a 20 something women say to her friend when talking through a career change and how her dad might object. Remember, they’re just parents. I bought a boneless rib eye and a boneless New York strip steak which we sliced and shared. About a half hour before cooking take the steaks out of the refrigerator to bring them up to room temperature. Sprinkled them on both sides with salt and pepper. Rub the onions with olive oil. Heat a gas grill to high. 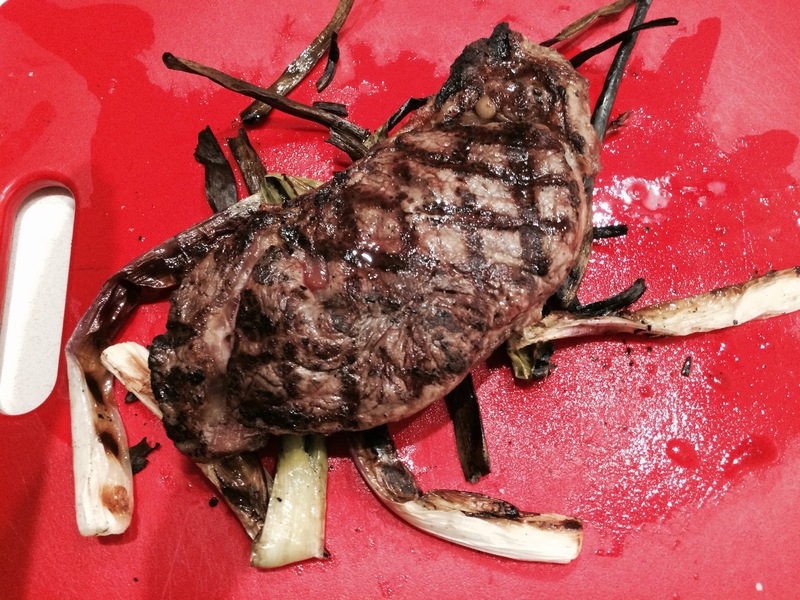 Drizzle the steaks with olive oil. Put the steaks and onions on the grill. Cook the steaks about 4 – 5 minutes, then flip and cook the other side another 3-4 minutes for medium rare (135 degrees). Cook the onions, turning periodically, until well charred. Remove the meat and onions form the grill and allow to rest for about 5 minutes before serving. Trim the green outer leaves from the cauliflower. Cut the florets away from the stems. Cut the florets into small pieces, about an inch each. Take the core of the cauliflower and slice off the tough outer skin. Put the tender part of the core and the stems into a food processor and process until pureed. Bring a large sauce pan of water to the boil. Add salt and a teaspoon of vinegar to the water. Blanche the cauliflower florets in the boiling water for about 2 minutes. Drain and put into a bowl and sprinkle with salt and pepper. Put the butter into the sauce pan and add the shallots. Saute over medium low heat for about 5 minutes. Add the cauliflower puree (the stems and core) to the shallots along with 1/2 cup of water and the fresh herbs (bay leaf, parsley and thyme). Bring to a boil, then simmer for about 5 minutes to cook the cauliflower. Add the cream and cook at a simmer for 3 more minutes. Remove the herbs from the cream and disgard. (Mr. Keller now blends this cream in a blender until smooth because he likes to use every appliance in the kitchen I think. I’ve blended it, but I’ve also skipped this step and just left it a little chunky) Toss the cauliflower florets with the cream. 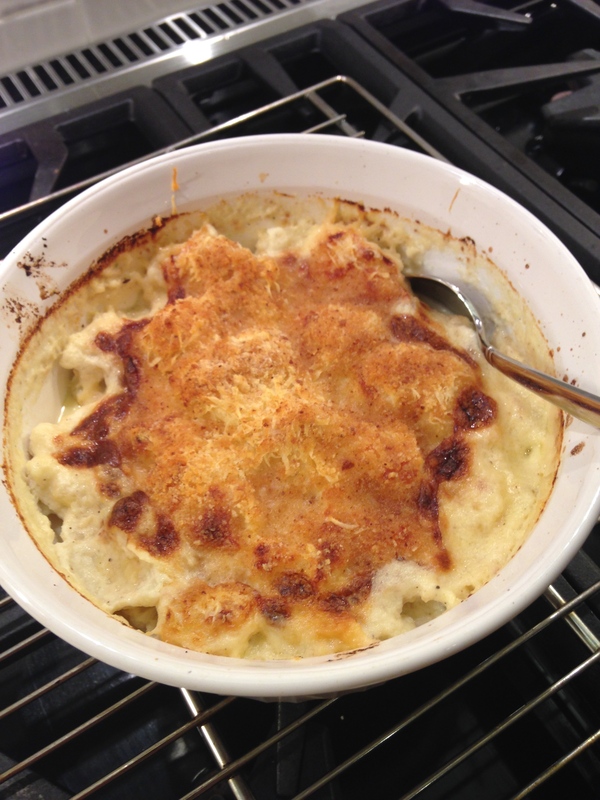 Dump the cauliflower into a small casserole dish topping it with the bread crumbs and two cheeses. Preheat the oven to 450 degrees. Bake the cauliflower in the oven for 15 to 20 minutes until it is well browned on top and bubbling. 3 Responses to Just Parents. What are the settings for regulating just parents? If you ask me, there’s too much regulation. I’m voting for Rand Paul. Good Eye! More regulation to stop relegation!